Almost 25 years ago now I delivered what was easily described as the worst speech of my life. I was nervous, I stumbled, it was awkward. And yet, the one speech changed the course of my life forever. From the people in that conference breakout room my firm landed several million dollars in contracts over the next few years. 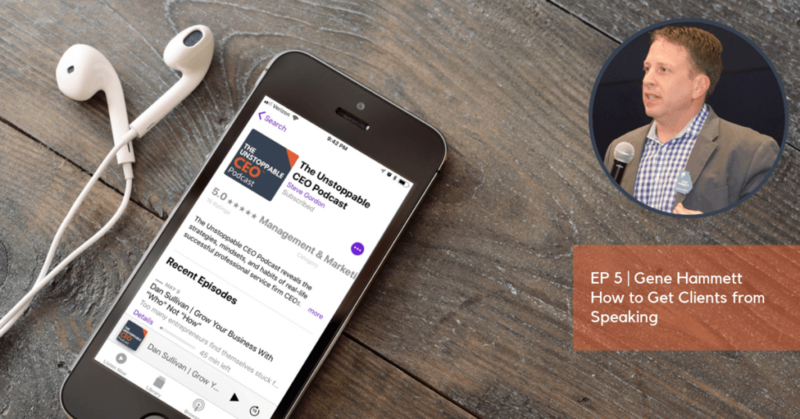 Speaking is one of the easiest ways to attract clients and in the latest episode of The Unstoppable CEO™ Podcast I interview with Gene Hammett…he’s an absolute wizard at driving business success through speaking. He’s not a “here’s how to get paid big bucks to speak” guy. Instead…he’ll show you how to use speaking to get clients for your business (and you’ll probably make more money than that big name speaker you heard at the last conference). Plus, Gene reveals his secret to finding and keeping focus in your business. We discuss the real secret to being productive (it’s not what you think). 01:47 Gene starts off by telling us how he deals with the tough roadblocks that businesses have thrown at him- he hired a coach. 06:15 Gene tells us his interesting way of staying focused on his goals and not get distracted from them. 13:12 Gene tells us the thing that he is most excited about this year, and why it’s changed from his forthcoming book. 15:56 Steve talks about his tough first experience with public speaking and how it lead to $5M in contracts! 17:34 Gene tells us how he can teach you to leverage your network through speaking as well as beyond just that moment on stage. 21:19 Steve gives us a further example from his own business experience how speaking is such a powerful tool. 23:02 Gene talks about a young guy who from one simple speech has gotten $800,000 worth of contracts in 18 months, and outlines fear as the biggest barrier. 28:37 Gene explains the importance of referrals when he first started out in business. 30:57 How to reach Gene and how to get some very valuable templates…..for free!